1. How is reused code in the classes? 2. What are the ways (approaches) of building classes to effectively ensure the reuse of code? 8. What are differences between composition and inheritance? The essence of reusing code is that you do not need to write the code again. It is much more effective to use previously created and tested code. For this, classes that take all the advantages of an object-oriented approach to programming are best suited. Before the advent of object-oriented programming, procedural-oriented programming existed. In the procedural-oriented approach, in order to reuse the program code, the method of copying this code was used. This approach was not sufficiently effective. With the increase in the code of the software system, it caused a rapid increase in errors. If you need to reuse existing code, then the classes must be built in such a way that you do not change (damage) this code. delegation. This is something intermediate between composition and inheritance. These methods are also called relations between classes. In all ways, new classes (types) are built on the basis of already existing classes (types). in the constructor (object a2). Example 2. The Pixel class contains a Point class object. In this case, methods and internal variables of class A are available in class B. There is one limitation: available in class B are only methods and variables that do not contain the ‘private’ access modifier in the declaration. internal method SetA() of class A. The Demo() method of class B demonstrates access to the variable and method of class A. Example 2. A Point class is given that describes a point on a plane. The Point class is the base class for the Pixel class. More precisely, the Pixel class extends the capabilities of the Point class by adding an additional color variable and the SetColor(), SetXYColor() methods. In the instance is accessed variable x, which is declared in class Point. This code is correct, because the Pixel class inherits the Point class. This is a feature of inheritance, in which you can extend the capabilities of an existing class. The Pixel class is a superset over the Point class. Three classes with names Point, Line, LineColor are declared. 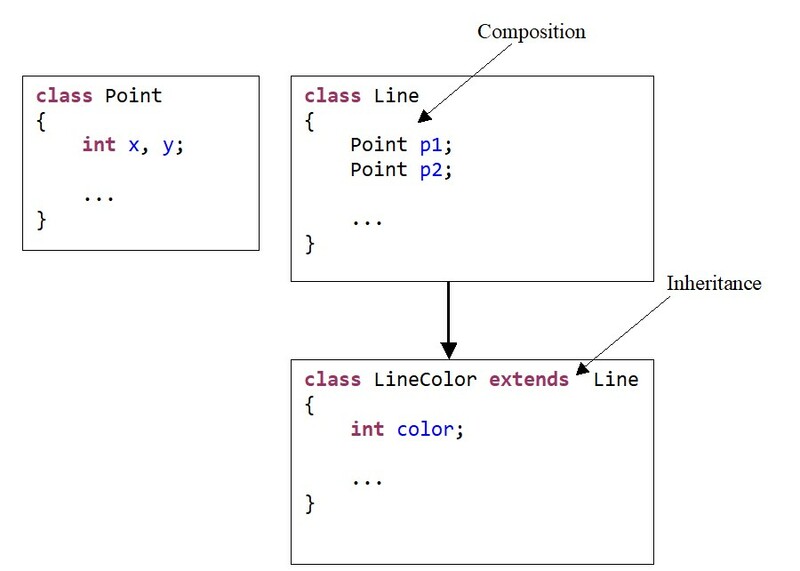 Between the Point and Line classes, the composition is implemented. The Line class includes the declaration of objects of the Point class. Between the LineColor and Line classes, inheritance is realized. The LineColor class inherits the internal variables and methods of the Line class. The unification scheme is shown in the figure. The source code of the module with the developed classes. Delegation is an intermediate link between inheritance and composition. The following example explains the essence of delegation. This organization of the relationship between classes is called delegation. MethodA() of class B is called a delegated method. 8. What are the differences between composition and inheritance? Both composition and inheritance expand class capabilities. Both composition and inheritance allow class subobjects to be placed inside a newly created class. However, there are differences between composition and inheritance in terms of choosing how to create a new class. Inheritance allows you to expand the capabilities of the new class in terms of its specialization. This means that a specialized version of an already existing class is being created. That is, an already existing class (base class) is taken and its new specialized version is created. As a rule, a general purpose class acts in the base class role, in which the general features of the task are highlighted. Inheritance implements the relationship “is”. Composition is used when you need to use the functionality of an already existing class in another class. In this case, the newly created class declares an object of the class whose functionality you want to use. A class object in another class can be hidden, private, public, or protected.